​Click on the image left to learn more about PICASSO, in a video featuring Dr Joanna Fardell and Exercise Physiologist David Mizrahi. ​Cardiovascular fitness is a strong indicator of current and future health, and is tested in many chronic health conditions. It provides information to monitor patients or to give recommendation to intervene with a lifestyle intervention. It is not currently tested systematically amongst childhood cancer survivors, who have been shown to reduce their cardiovascular fitness levels after treatment. To determine if testing participants at a submaximal exercise intensity (below their maximum capacity) can predict their cardiovascular fitness. 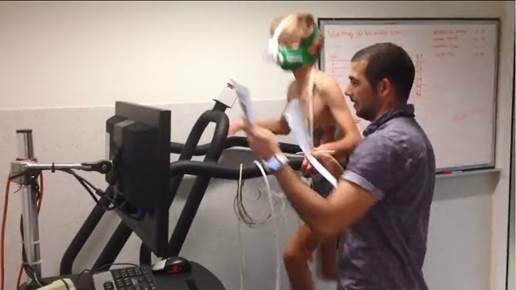 To determine the predictors of physical fitness in childhood cancer survivors. Findings from this research will be used to inform recommendations on following up cardiovascular fitness levels of survivors. ​Participation in this study involves one face-to-face visit (approx. 75-90 minutes) completing two exercise tests to measure cardiovascular fitness, completing a body composition analysis and completing a questionnaire pack. A questionnaire will be sent to you and your child a month after completing the study, which can be completed as a paper copy with a return paid envelope included, or online. We also ask for consent to obtain your child’s treatment history from the hospital medical records.